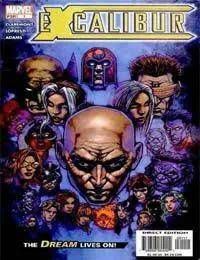 In Genosha, Xavier thinks back about the destruction that his twin sister, Cassandra Nova, caused. Resolving his emotions, Xavier opens a secret compartment on the bottom of the coffin near him. He removes an outfit that seems more soldier-like and a handful of electronic devices, including weapons. Trying to pick the coffin off the ground, he is embarrassingly thrown to the ground by his own momentum.